Hello! 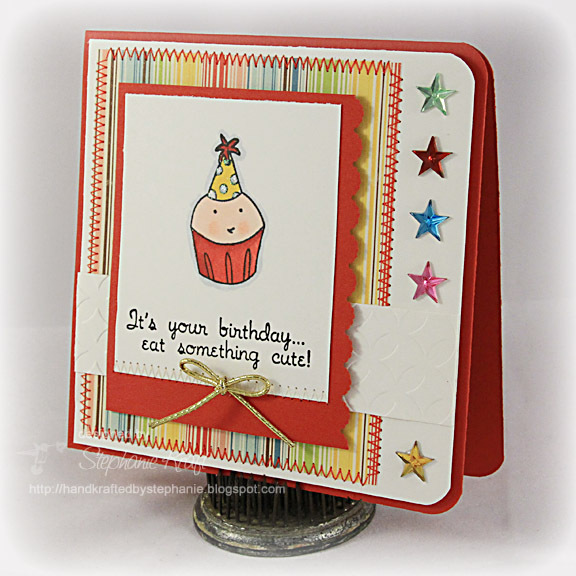 I have 11 birthday cards to make for the teachers and staff at Sabrina's school (between now and the end of December), so I figured I better get going on them... :) I thought this image of Cuppie would make a fun card, and it fit nicely on this layout using the latest Taylored Expressions sketch #133. I stamped and colored Cuppie (from Sweet Celebration), then I added some Starfire glitter to the polka dots on her hat (it's super sparkly in real life!). The sentiment is from the same set. For the embellishments along the right side of the sketch, I adhered some 12 mm rhinestone stars in various colors. Accessories: Scalloped Scallop border punch (EK Success), Round-it-All (Zutter), Retro Diamonds embossing folder (Quickutz), Markers (Copic), Starfire glitter (Taylored Expressions), Star rhinestones (Pizzazz Aplenty), Gold cording, Foam tape, Thread, Sewing machine. Adorable! Design is fantastic as always! Lucky teachers! Love this! The stars are such a fun addition! Love it! 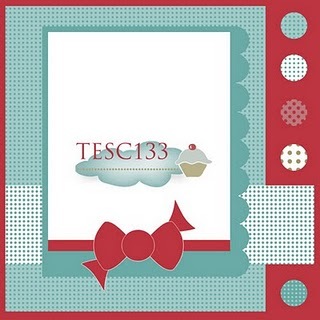 Great TESC card! Super cute card Stephanie! I remember that lil' cupcake birthday card you made me :) Love the colored thread and all the stars! SUPER cute Steph! Awesome Cuppie creation! This is just CUTE as can be!